To promote correct pronunciation, only Sanskrit examples are pronounced. All sounds are repeated twice with space for the student to pronounce them. PART 1 contains the recitation of the flashcards in progressive (card) order. 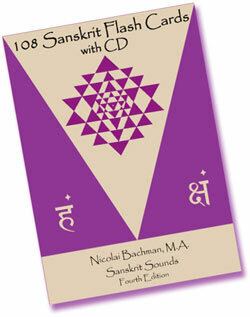 Each sound is repeated twice followed by a Sanskrit example (shown on the card) repeated twice.